Vibrant, dynamic, and ever so lively, Goros is the perfect venue for your next celebration or event, offering plenty of rooms and spaces. Enquire today. A one stop shop for a fun night out! Chanelling the energy of Japanese pop culture, from food to sake, whisky, beer, cocktails…and of course karaoke, Goros is the ideal party place for your next celebration or event. 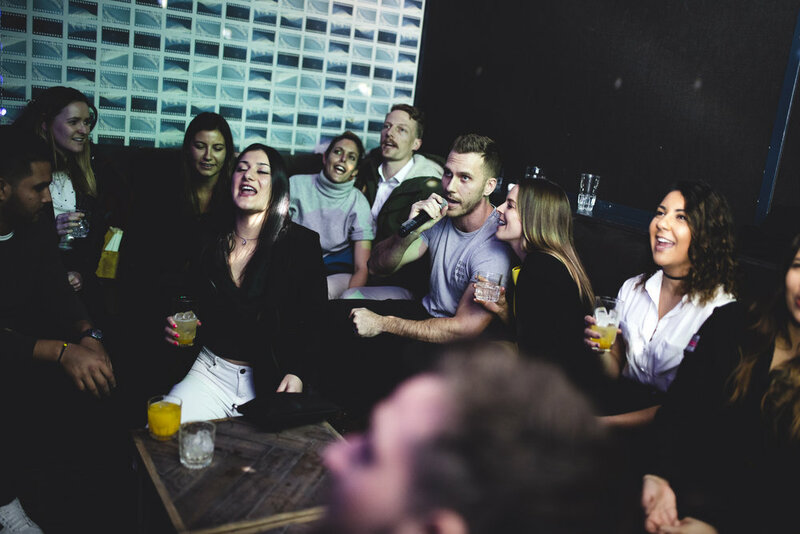 With three private karaoke rooms and that all important late night license, Goros is a vibrant, dynamic venue, with plenty of personality to delight. Fancy Goros to yourself, speak to our team about hiring it exclusively! A fun filled venue for up to 30 people, the Private Den at Goros is your location. Combining traditional Japanese food, DJ’s and an extensive sake menu with a twist of Japanese pop culture this is one of the best party spots. From a small gather with mates to an area take over, the front booths are they perfect place to enjoy sake bombs and the Goros vibe. This space can host from 6 up to 42 guests. For that authentic feeling of a Toyko dive bar but without long flight, the middle booths at Goros are for you. From a booth for 6 to the full area, the middle booths are the perfect party place. For an event to remember choose from one of the three karaoke room at Goros. With state of the equipment, the latest tunes, delicious Japanese food and an extensive sake menu this is the perfect combination for a night out for 10-15.